The original intention of this post was to display a second gallery of photographs taken by Joe Coakley of the Lizards at the 2019 World Show. Anyone who has read Joe’s critique in Part 1 will know that some of the judges’ decisions were very controversial. I have now received a report about the conditions under which the Lizards were judged. I think they had a significant impact on the judging, and deserve to be reported here. According to my source (based on reliable eye-witness accounts), the Lizards were the last variety to be judged. The show organisers were up against a deadline. They drafted volunteers to get the job done on time; hence a bizarre total of seven judges for a section of less than 300 birds. One class was so rushed that the show cages were stacked five high on the floor. Some birds had run out of seed and had to be fed just before judging. Judges have to take responsibility for their decisions, but when I heard of these problems I felt some sympathy for their predicament. It is not the fault of the judges that there was so much chaos and so little time. The responsibility for that lies with COM, because it is they who organise the timetable and allocate the judging resources. I hope that readers will complain to their national associations. This is the second year the Lizard has suffered from unsatisfactory judging arrangements. Why should we put up with a system that treats the Lizards as ‘tail end Charlies’, an afterthought? The real answer, as Joe suggests, is to go back to the previous system which allocated no more than two judges for the Lizards, usually (but not always) people who knew the breed well, and gave them the time to do their job properly. Whether COM-OMJ will acknowledge the shortcomings of the present system is another matter. Now back to the original subject of this post: the gallery. 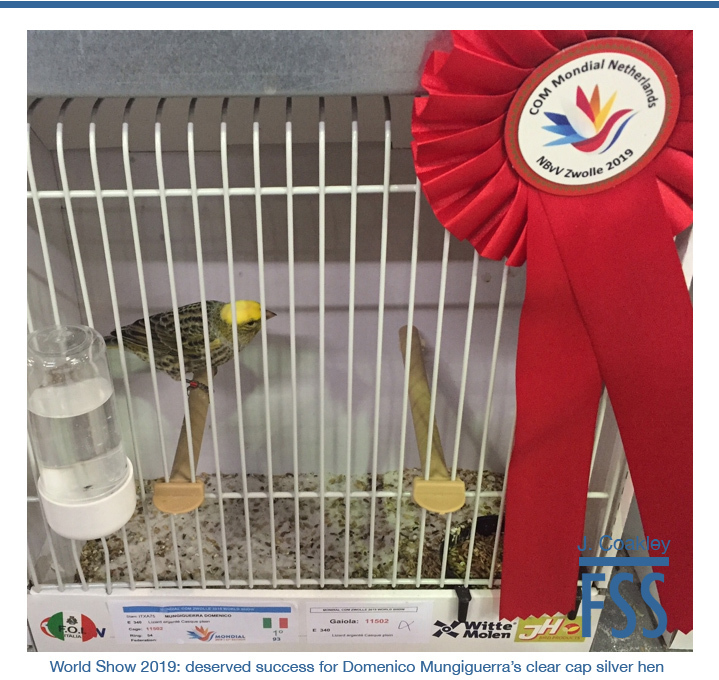 The photos were chosen at random and intended to portray a wide range of the Lizard canaries at the World Show. Don’t make the mistake of assuming that the first gallery included all the best birds. That’s not so, I saved some very good birds for last. The second group of pictures portray a lovely quality of birds and maybe in hindsight the first batch should be edited by that I mean remove the very poor quality bird that was posted that received crazy marks. I mentioned to a friend and we agree I think that the judge made an error with the points allotted. Thank you for sharing these second batch of pictures.